I just returned from Maui, HI and feeling so grateful that my honey and I finally went! We talked about it since he came to US from Africa 4 years ago – wow how time flies. While in Maui, someone said “living in Maui is like living in a bubble.” It was pretty cool – he went on to explain that for the most part – they avoid TV, news and the negative crap going on in the world. Instead they enjoy lush surroundings and appreciate the life they are blessed to live on this amazing, breathtaking island. Interesting about the bubble talk as I was in the middle of writing this blog article about the kind of bubble we live in. But I also realized that we can be living in a limiting bubble and that is what I wanted to talk about today. Is your personal bubble serving you? What kind of bubble are you living in? Your personal bubble is the world in which you live with all your thoughts, feelings, experiences and perspectives included. It is your personal space around you and what is in your head. Your own unique Universe. Your personal bubble it’s all about us. How we look, feel, believe. What we do, eat, fun stuff, stuff we hate, who we engage with, our job – our life. 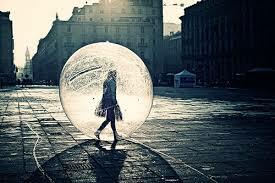 When we’re in our bubble everything affects us personally. Including what others say, do or how they act toward us – even when really it’s not about us – maybe it’s their shi#t and their taking it out on us- but we still take it personally. Our awareness is limited. Our bubble is only our perspective. Know what I mean? When we are in our bubble in this way – it is not serving us. We avoid things that could enhance our life. Our bubble is our comfort zone and don’t want to get out of it – we avoid trying new things even if it can improve our life. We become fearful of the unknown – going for new job interview or meeting someone new. We start to lose confidence. To get out of our comfort zone means testing our personal power. When we don’t try new things or test our personal power – our confidence begins to shrink and doubt grows. We start to feel disconnected from others. When our confidence shrinks we close off more and more – become disconnected with others, with our happiness and even our purpose. We fear failure and that contributes to closing off. We procrastinate because of the fear of failing. Our life becomes stagnate, purposeless and even boring. We are becoming smaller in our energy, ideas, creativity, motivation. How to get out of this kind of bubble. It all starts with personal awareness. Start questioning yourself on why you are not feeling happy, disconnected, lost or frustrated with life. Or noticing that you are feeling less confident than you used to feel or that your relationships are changing – less rewarding, authentic, loving, or just less in general. These are signs. You are the center of your universe, and everything is related to you, your perspective and your feelings. This can contribute to why you can’t get motivated, implement new habits or you blame others for the way life is turning out – you’re in the bubble of limited awareness and opportunity. Expand your bubble. For example, think of your bubble as an energy field around you. If your energy is only 5 feet around you – that limits your perspective and possibilities and you feel small, stuck and isolated. But if you imagine expanding your energy 300 feet up and around you (do this now just imagine opening up and stretching your inner light higher, wider, deeper) – you feel bigger energetically and you open to discovery, seeing new things, hearing new ideas. You are even connecting to the Universe in a way that magnetizes more goodness back to you and allows you to receive what you deserve and desire. Practice expanding your mind and heart too. Feel what others must be feeling. Try to understand rather than condemning. See how little and petty your concerns and fears have been. Realize that if others treat you badly, it’s not about you, but about their suffering. See how you can help others. How can you lessen the suffering of others? Sometimes it’s just by paying attention, just listening. Other times you just need to be there, just lend a hand. You don’t need to go around solving everyone’s problems but be there for them as you would like them to be there for you. See if you can make people’s lives better – create something to make them smile. Make them a little part of your world too – be a little space of goodness. You’ll learn to be bigger than yourself. You’ll learn that the life we’ve been given is a gift, and we must make the most of it, and not waste a second. You’ll learn that there is nothing more fulfilling than making the lives of others a little better which in turn enhances yours.Being in a bubble can be a good thing when you are intentionally creating your life with positive thoughts – this is great self care and helps you to attract the same back to you for sure. And yet, if you are feeling small, disconnected, frustrated, lacking life and purpose – it’s time to look at the bubble you are living in and decide if it is serving you or hurting you. Perhaps it is time to expand that bubble and allow more of the right things in so you can be more connected to others, discover and experience. You deserve it all and can have – open up to the possibilities! Need help? Something else to try, click here.